Children are a precious and fragile gift from God. What are we going to the do with that gift? Jesus did not ignore that gift, instead He opened His arms wide and invited them in. He took time with them, talked with them, laughed with them, and appreciated each individual trait He formed in them. At KCS it is our privilege to assist in bringing up these children, these wonderful gifts God created. It is our privilege to nurture these children in a personal relationship with Jesus Christ and to watch them grow into young men and women who possess a strong faith in God and receive His kingdom. It is a privilege as teachers at KCS to be an extension of the arms of Jesus, enveloping his children, giving them a safe place to learn and grow. As a teacher, I am richly blessed every day by each child that walks into my classroom. It starts simply with a “good morning” or a warm smile as they walk into the room. Each little person carries with them a story written especially for them. It is my pleasure to assist them in realizing their story. I cherish the opportunities I have to spend individual time with each student, making them feel like they are the only person that matters at that moment. In doing so I am reciprocated doubly, as in turn they make me feel just as special. Yes, there are many things that must be covered academically each day, but the most important lesson for any child is that they are loved unconditionally by their Creator. Lord, bless each day, and bless the children you have planned to cross my path. Help me to be what they need me to be. Thank you for calling me to be a teacher. 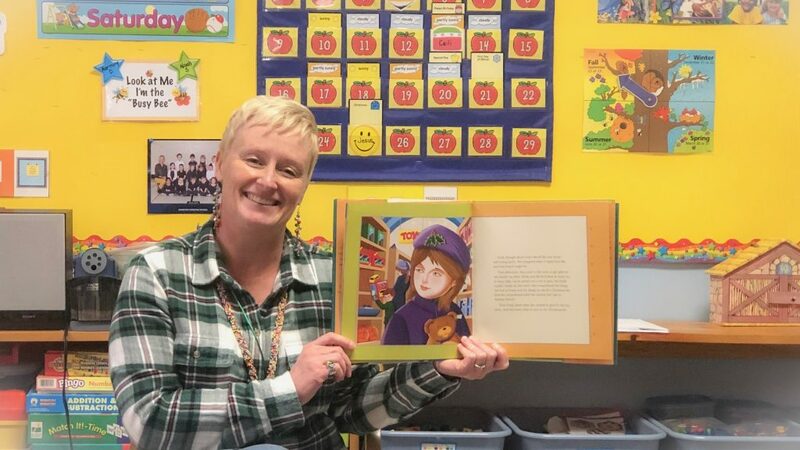 A statistics Canada study has determined that the early reading skills of a child are significantly linked to their achievement and ability to understand printed material in later life. That is why KINDERGARTEN MATTERS! Research conducted by the Barna Research Foundation has found that a child’s moral foundation is predominantly set by the age of 9. That is why CHRISTIAN SCHOOL MATTERS! The Christian Kindergarten must be respectful of the children it hopes to educate. The program of instruction must be guided by a sound understanding of the nature of the young learner and the key relationships to be enhanced between the classroom, the school, the home and supporting agencies. The following six statements provide a framework for a Christian Kindergarten program. Young children learn best when programming meets their developmental needs. The Christian Kindergarten engages young children in their learning best when program goals and activities reflect a deep understanding of the inherent capabilities and limitations for learning for this age group. The inclusion of play in Kindergarten programming is an essential vehicle for the social, emotional and cognitive development of the young child. Young children must develop knowledge, skills and attitudes that prepare them for later learning. The Christian Kindergarten program encourages the development of skills, knowledge and attitudes so that the young child is able to succeed in elementary school education and beyond. Young children with special needs, through early intervention, can develop knowledge, skills and attitudes that prepare them for later learning. The Christian Kindergarten incorporates assessment in its program to identify young children with special learning needs, so that interventions can be implemented to assist with successful learning in Kindergarten and beyond. Young children need to build a common set of experiences with others. The Christian Kindergarten provides a learning setting that encourages the young child to experience communal living and learning in the love of Christ. Social development is a key aspect of the Kindergarten experience. Parents must have an opportunity for meaningful involvement in the education of their young children. The Christian Kindergarten engages the parents of young children as partners in the learning task. The home and the school share a common calling to nurture the young child holistically before the face of God. Coordinated community services must meet the needs of young children and their families. The Christian Kindergarten provides links and referrals to community services so that parents can access supports in the areas of health, social and family needs. The goal of a developmentally appropriate Kindergarten is to accept all children where they are and take them forward on their learning journey.